Today, 3.3.2014, is the second NHS Change Day. Change Day is about making changes that matter in our everyday practice and reminding ourselves of why we do what we do. Pledges can be big or small; it doesn't matter - the main thing is that each and every person who participates has a belief in the values of the NHS and great patient care, and is passionate about keeping it that way now and in the future. You'll see from the Change Day website that there is a wide range of participants; managers, doctors, nurses, allied health professionals, and patients. 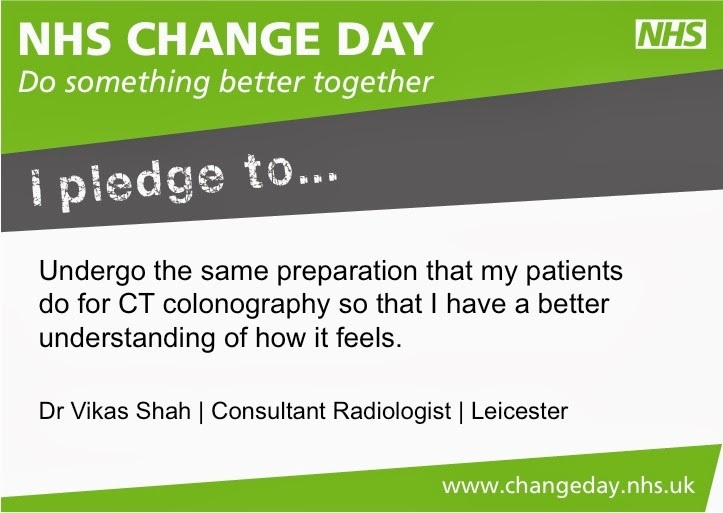 Today, I am pledging to "undergo the same preparation that my patients do for CT colonography so that I understand how it feels for them". CT colonography is a test used to examine the lining of the large bowel, an alternative to a colonoscopy (camera test) or a barium enema. Although I have changed the preparation for this test from the traditional laxatives to something far more tolerable and safer, this is based heavily on an understanding of the literature and networking with colleagues around the world. I have conducted patient satisfaction surveys to compare my preparation regimen to others and know that it is preferred by patients. However, today, I really want to know what my patients are going through when they prepare for this test. So today, I am following the preparation exactly as they would for the test. This means having a low residue diet all day today (no starchy foods, to reduce the bulk of the stool in the bowel for the test) and taking 20 mls of Gastrografin (an xray dye that softens the stool, and paints it white for the CT scan so that stool stands out from polyps of the bowel wall) at 9 am, 1 pm and 5 pm. Infact I have just taken my first 20 ml dose now. I like aniseed so I actually quite enjoyed it! I have always maintained that my preparation provides the most convenience and comfort for patients compared to others used both here in Leicester and elsewhere whilst maintaining quality, so today I want to show this again. I hope that by tomorrow morning I will have a much better understanding of how the preparation actually feels, and if I need to make any changes then I will be far better informed than by just reading the literature. What pledge will you make today?